← 7 January 2016 Salted Cod Fish Stew. This is y first attempt at making Kimchi. I did not record each ingredient only the finished product in fermenting mode. The ingredients are napa cabbage,carrots, red radish,garlic, green onions, cooking onion,whole wheat flour,sugar, balsannic vinegar,guacamole,soy sauce, dulce,ginger,Paprika,sprinkle of hot pepper, almost all I could find.From my research almost any vegetable can be utilized. I purchased the bubblier and rubber stopper and drilled a hole in a plastic lid to accommodate.The sauce was very pleasant tasting. It will be allowed to ferment for a week or more before utilizing. If this turns out well, I will enlarge my efforts and ferment many more products. 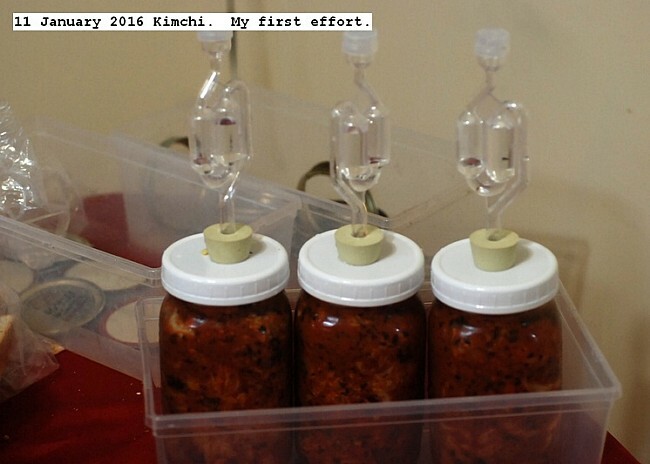 This entry was posted in Uncategorized and tagged Kimchi, Making Kimchi. Bookmark the permalink.